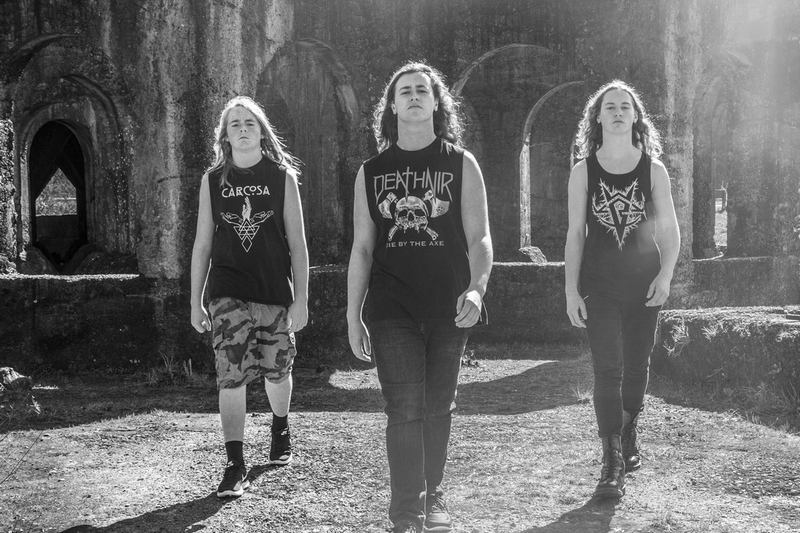 The New Zealand teenage trio Alien Weaponry just released their debut album Tu, which has lyrics in both English and Te Reo Maori. They are in the spotlight for this week’s Meet The Band. Bassist Ethan Trembath introduces us to his band. Chad Bowar: Give us a brief history of Alien Weaponry. Ethan Trembath: Alien Weaponry started off when Henry was 10 and Lewis was 8 years old and they wrote their first song “80th Death.” I joined the band two years later after meeting Lewis at the local circus school where one day we had a circus gig. After that gig my mum couldn’t pick me up so I went back to Lewis’s place along with a bunch of other mates. We were just hanging out in the practice room while Lewis and Henry were jamming, so their Dad Niel passed the bass around to the kids so they could give it a go. It turned out that I was the only kid there who had arms long enough to reach the end of the bass, so they abducted me and I became the bass player for Alien Weaponry. From there we entered Smokefree Rockquest (a high school band competition) and went on to win it in 2016. That’s when we met Tom Larkin (drummer from Shihad) and got started on recording for our album Tu. Describe the songwriting and recording process for Tu. There were quite a few songwriting techniques involved. Some of our songs are pretty recent while others are older, so the techniques have changed over time. Probably the most common one is us three jamming away in the practice room until we come up with something we like, from there we build on that and add lyrics later on. Other times we have just locked Lewis in the practice room until he came up with something, or we have had sudden inspiration at 2 o’clock in the morning so we build off that. We actually recorded and produced half the album in 2016 with Tom Larkin at Roundhead studios. We finished the rest off in 2017 with a different producer named Simon Gooding at the same place. It was really interesting with two different producers from different backgrounds. The entire album is pretty diverse but over all it has a real thrashy, brutal, and upbeat sound to it. The band has been compared to Sepultura. Do think that’s a fair comparison? It’s funny that people often say that because we had never listened to Sepultura prior to the comparisons. For me at least, I dont see many similarities aside from that we both sing in our native language and we play metal. Love Sepultura though! What led you to do many of the songs in the Te Reo Maori language? Niel would always tell stories of great battles between Maori and British soldiers wherever we went. So when our mates in Strangely Arousing inspired us when they won PacificaBeats in 2014, it came pretty naturally. We discovered quickly that metal and Maori go hand in hand, because of the aggressiveness in both haka and metal and the great stories and topics they talk about. What are some of the lyrical topics you cover? Most of our songs cover controversial topics that people sometimes find difficult to speak up about or talk about stories of epic battles and courage. Songs like those are usually written in Maori while our English ones often talk about more personal stories like anything from teachers at school to the pressure of society. How did you decide to do an Indiegogo campaign, and were you happy with the results? We had been saving up for the album for about two years but we were not there yet. We knew that if we carried on like the way we were it would be quite a while before we had the necessary funds. So we thought we would try out a crowd funding campaign. And we are super satisfied with the results! It was awesome to see all the love coming from all over the world! Lewis actually started off the whole thing on accident! He met a guy named Oliver at a music managers forum, and little did he know he was a contact for Das Machine. So, we got to know Oliver and eventually Das Machine sent us over a contract. Not long after, Das Machine had sorted out a contract with Napalm Records and we were more than stoked to sign it! We always set our sights high. So we’re aiming for our album to go platinum! Triple platinum wouldn’t hurt, though. What has been your most memorable Alien Weaponry live show? For me, it had to be opening for Prophets of Rage at Spark Arena. It was so crazy to be playing with some of my music heroes in front of such a huge crowd. Playing at Spark Arena was one of those insane goals I had set. I never thought I would actually achieve it! Explain what a haka is, and how it’s incorporated into your shows. Haka can be used in heaps of ways! Often used to show your support to family and friends or to celebrate a victory, haka is traditionally used to intimidate your enemies before battle. One way we incorporate this is the way we sing and structure our lyrics. We often sing very aggressively and not always very melodic. In one of our songs (“Te Ara”) we actually have an ancient haka from Henry and Lewis’ Te Arawa tribe included towards the end. We just had our album launch party in Auckland at Galatos Ballroom. After that our next thing on the list is heading off to Australia for three gigs at the beginning of July, and from there to Europe for about three months where we’ll be playing at heaps of amazing festivals with heaps of amazing bands. We are particularly excited to be playing at Wacken, Germany in August because it’s been a goal of ours since we started. Has the internet made it easier for a band from New Zealand to “break through” in the rest of the world? I definitely think that if it weren’t for social media we wouldn’t be where we are now. It was partially the release of our song “Ru ana Te Whenua” that has over one million views on Facebook now, that kicked us off. The majority of the people that know of us have found us on the internet. I think this is especially evident when it comes to oversea fans. If it weren’t for the internet we wouldn’t have had so much response coming from the rest of the world at the moment. It was a huge surprise to find that at the moment most of our monthly listeners are from America! How was the video shoot for “Kai Tangata”? It was great! We spent about three and a half days shooting it. For one of those days we spent most of the day at the Waipu Caves and then we were up until midnight blasting music just outside our house on the back lawn. It was suprising that we didn’t receive any complaints from the neighbors. It was also awesome to spend a day shooting with New Zealand’s top kapa haka group, Te Matarae I Orehu, who were involved in the battle scenes! Is it difficult to balance school and typical teenage activities with music and the obligations that come with being a signed band? Sometimes it can be very difficult trying to balance the band with homework and stuff like that. I’m trying to pass my NCEA level 2 before we head off to Europe this year. At this this stage I’m on track to achieve that, so I’m not too worried. The band always comes first though. A few days ago Lewis and I discovered a band called Sevendust so I’ve been jamming them hard. I’ve always been a massive fan of Animals as Leaders, Veil of Maya and of course I still love to listen to my early inspirations like Rage Against The Machine and Trivium.